Our Vision is to nurture a whole, intelligent, pre-teen with high levels of self-esteem. Our Mission is for the children of Tampa to receive the finest A.M.I. Montessori education for wholistic child development. 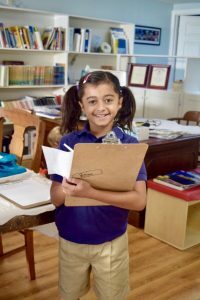 The curriculum at the Montessori Children's House of Hyde Park reflects the traditional educational principles and practices established by Dr. Maria Montessori. This approach values the human spirit and focuses on the development of the whole child - the physical, social, emotional and cognitive, during the most formative years of life. 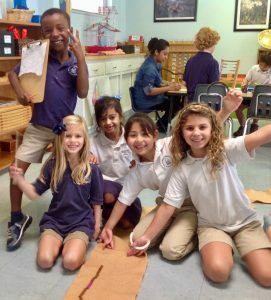 Following Dr. Montessori's vision, our program nurtures the innate potential of each child. Within our prepared environments, children are free to respond to their natural drive to learn and work. Our program emphasizes the importance of learning through all five senses versus just through listening, watching, or reading. Students in our are encouraged to explore, discover, and experience the world. They learn by "doing" and engaging in multi-sensory exploration, which in turn, deepens their learning experience. The hand engages the brain, and our prepared environments are the only educational approach to utilize this learning method. At the Montessori Children's House of Hyde Park, we offer three mixed-age classrooms and educate children ages three through twelve. Children start in our primary classroom at age three and stay with the same Directress until age 6. The lower elementary classroom is dedicated to students ages six to nine. Lastly, the upper elementary classroom offers a setting specifically designed for children who are ages nine to twelve. Mixed- age grouping helps children acquire a sense of community and supports social development. Children of different ages help one another. Younger children take direction and learn from the older children. As older children mentor their younger peers, they develop confidence, increased independence, and leadership skills. Our goal is to provide each child with an education for life. We believe that every child is uniquely talented and we take joy in discovering, activating and nurturing those gifts. After completing our program, each student emerges a critical thinker, adaptable, and independent.